The Tulsa Drillers are headed back to the Texas League Championship Series. 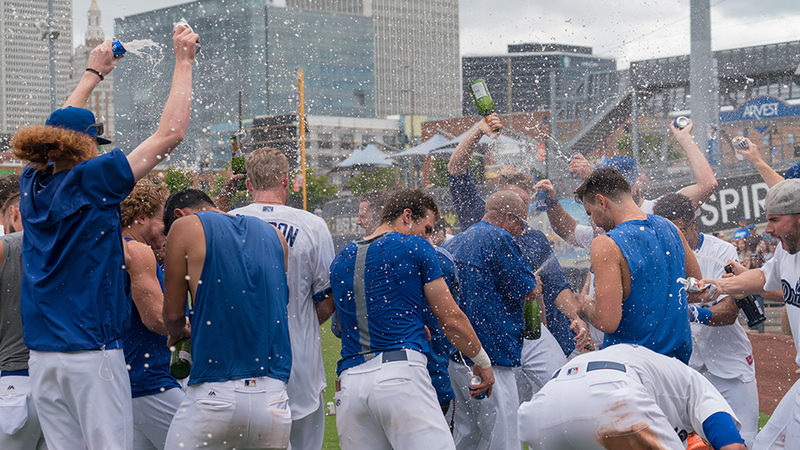 The Drillers capped their second straight North Division title Sunday afternoon at ONEOK Field with a 5-3 win over Arkansas in the fifth and final game of the best-of-five series. Tulsa rode three hits from Gavin Lux and a dominant performance on the mound from Mitchell White to gain the decisive victory, but still had to survive two scary final innings to take care of the Travelers. Tulsa won the final two games of the series, staving off two elimination games, to claim the division title. It marks the second straight season that the Drillers have won game five of the North Division Series at ONEOK Field. Tulsa will host games one and two of the Texas League Championship Series on Tuesday and Wednesday nights with both game starting at 7:05 p.m. at ONEOK Field. The series trend of early scoring continued in Sunday's game five finale as the Drillers took a first-inning lead against former Atlanta Braves starting pitcher Williams Perez. Leadoff batter Lux lined the first pitch from Perez for a leadoff single. On the next pitch, Drew Jackson lined another base hit into left field to put runners at the corners. Keibert Ruiz made it three straight hits when he beat the Travs defensive shift by dropping a base hit down the left field line, scoring Lux with the game's first run. The winning team in every game of the series scored a first-inning run. Ninth-place hitter Eric Peterson helped the Drillers add a second run in the third inning. Leading off, Peterson reached safely on an infield single and moved into scoring position by swiping second base. Lux brought him home with a lined double that fell just out of the reach of a diving Chuck Taylor in left field. A two-out rally that was again started by Peterson helped the Drillers extend their lead to 4-0 in the fifth inning. With two-outs and the bases empty, Peterson lined a double just inside the right field line. Lux continued his big day when he again jumped on the first pitch from Arkansas starting pitcher Williams Perez and hooked it just inside the right field foul pole and onto Elgin Avenue for a two-run homer. Matt Walker relieved Perez to open the bottom of the sixth inning, and D.J. Peters deposited his first pitch over the left-center field fence to increase the Tulsa lead to 5-0. It was the first home run of the post-season for Peters who led the Texas League with 29 during the regular season. The Travelers made things uncomfortable for the Drillers in the eighth inning. Reliever Michael Boyle took over for White to open the inning and retired the first two batters, but Taylor and Eric Filia followed with back-to-back homers to cut the Tulsa lead to 5-2. Tulsa reliever Nolan Long got the final out of the eighth, but the Travelers made things even more uncomfortable in the ninth. After Long surrendered a leadoff hit, he got a groundball double play to get the Drillers within one out of the title. The one out would not come easily as Chris Mariscal singled and scored on a double by Joseph Odom that trimmed the lead to 5-3 and brought the potential tying run to the plate. Layne Somsen, who was charged with both Drillers losses in the series, came on for Long and struck out Donnie Walton to end the suspense and book Tulsa's spot in the championship. White was magnificent and picked up the victory in his first playoff appearance this season. The right-hander allowed only two singles in seven shutout innings while striking out five. *The Drillers last won the Texas League Championship in 1998. The 20-year drought is the longest among current TL teams. The city of Tulsa has claimed the TL Championship a total of eight times with the first title coming in 1936. *Scavuzzo and Lux hit safely in all five games of the series with the Travs. *Peters had a busy afternoon, recording eight putouts in centerfield. *Sunday's meeting between the Drillers and Travelers marked the end of a closely contested series this season between the two teams. In 37 total meetings, Tulsa finished with 19 victories versus 18 wins for the Travs. The Drillers will open the best-of-five Texas League Championship Series Tuesday night at ONEOK Field. They will face either Corpus Christi or San Antonio in the championship. Those two teams are playing late Sunday afternoon in game five of their series. Tulsa will host games one and two of the TLCS on Tuesday and Wednesday with both games starting at 7:05 p.m. in downtown Tulsa. Games 3, 4 and 5 will be played in the South Division city.